$25 for adults, $12.50 for children ages 6-12, and children ages 5 and under are admitted free. Let us help you make this Mother’s Day special! Leave the cooking to us! 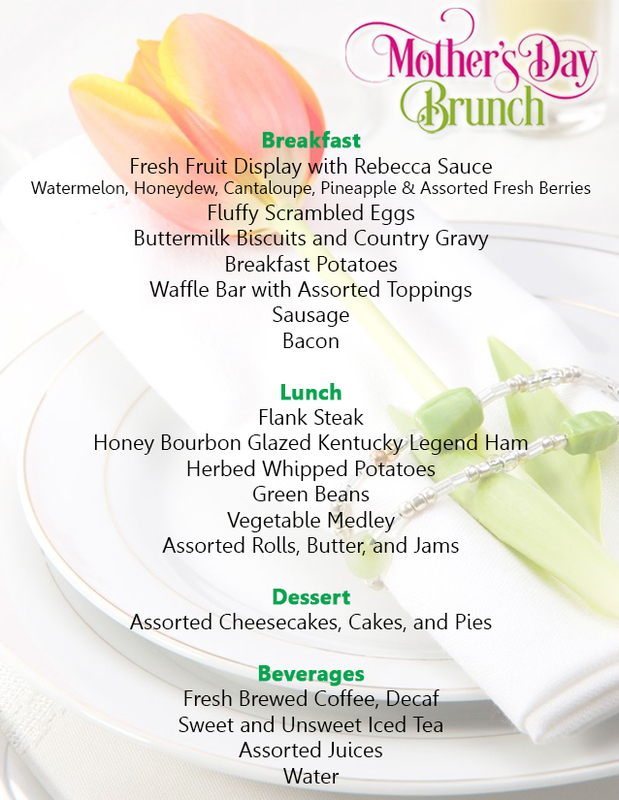 Gather your family and treat Mom to a delicious buffet of your favorites, including comfort foods like buttermilk biscuits and country gravy, waffle bar with assorted toppings to grilled flank steak and honey bourbon glazed Kentucky Legend ham, to a sweet finish of assorted desserts. Please see the complete menu below. Accommodations are available for small to large parties – we’ll customize your table according to your family’s size – from 3 to 30! – all set in the third floor ballrooms inside the Owensboro Convention Center, providing beautiful views of downtown Owensboro. Plus, each mom who attends will receive a complimentary gift to take home, and can register for a chance to win some wonderful prizes courtesy of Nick T. Arnold Jewelers and Free Your Mind Body and Soul Wellness. Tickets are $25 for adults, $12.50 for children ages 6-12, and children ages 5 and under are admitted free. Additional processing fees apply to all ticket sales.